December 1: All registration closed. PAYMENT PLANS: Payment plans available for some programs. Minimum of $400 due at time of registration. 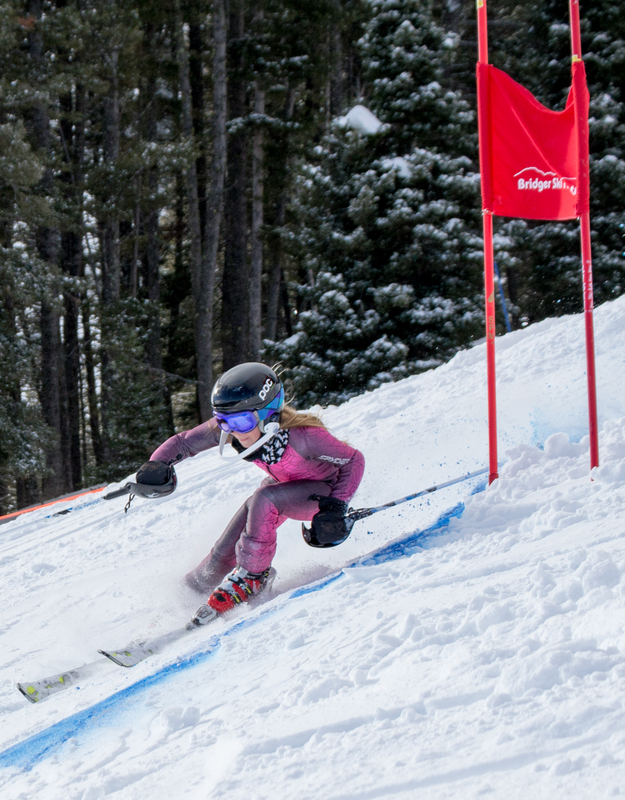 The Introductory Development program has four options for skiers ages 8-11, ranging from learning how to cross-country ski to more advanced skills. At this level, kids learn both traditional classic (striding) and skating techniques. We believe that kids, especially at this age, benefit from a diversity of activities. We maintain a balance between having fun, building a positive team environment, and advancing our skiing. We want you to love skiing as much as we do. No ski experience necessary. We'll group skiers by age and ability. Equipment: Classic and skate skis. (Skate rental packages available for $50.) See FAQs for more equipment info. The Introductory (Intro) programs are for beginning and intermediate-level skiers. 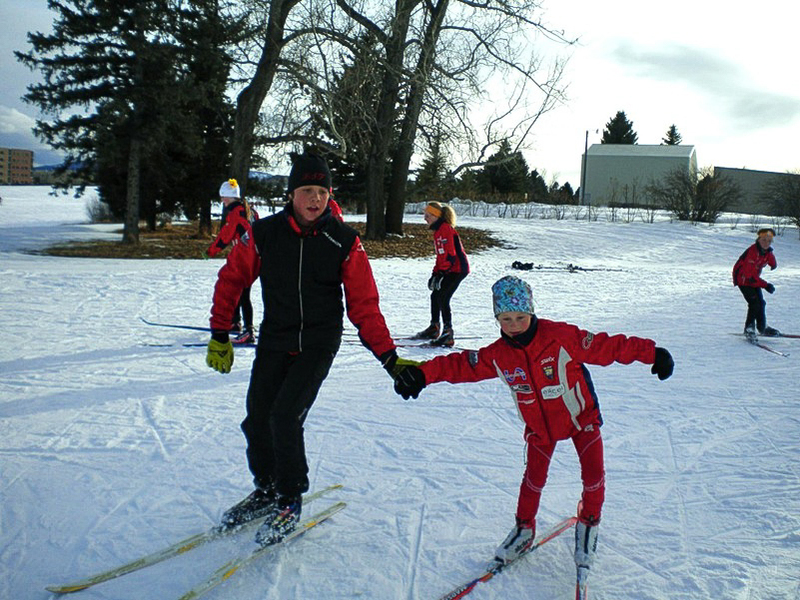 Skiers will work on the fundamentals of Nordic skiing through games, play, and with the help of certified instructors. Organized races are not a formal part of this program, but skiers may participate in the local fun races as they wish. Some xc ski experience needed. No physical fitness requirements. U10/U12 Intro Devo skiers have the opportunity to compete in local fun races and as well as travel to a few nearby youth races. How much--or if--you race is up to the individual. Sign up for the age group based on the child’s age as of January 1. Ask a coach if you're not sure which program (Introductory or Intro Devo) is right for your child. If a skier wants to move up to an Intro Devo program mid-season, just talk to a coach. We're flexible. Weekly emails from coaches will give you more details. Below is the general schedule. Tuesdays, Thursdays & Saturdays 8 a.m. - 10 a.m. Learn more about summer programs here. Anyone 10+ may also opt to join us for summer training and camps. All are welcome. Even nonskiers. Your coaches will send out weekly training schedules via email on Mondays, with a schedule of times and locations. Practice will start no later than 4:00 pm and 10:00 am. Pick up no later than 5:45 pm or 12:15 pm. Weekday winter sessions are typically at Sunset Hills (Lindley Center). Last-minute schedule changes do sometimes occur: we'll announce those as needed, via email. BSF has sprinter vans, and we are able to provide complimentary transportation for some Intro Devo athletes from the middle schools to practice most weekdays. However, space is limited. Please see your coach for details. Nordic skiers should dress in layered clothing that allows for a good range of movement and can be removed if the need arises. This prevents overheating but still protects them from the elements. Multiple layers are better than one thick, insulated layer. It is very often colder and windier at Sunset Hills (Lindley) than it is anywhere else in town. Even on a warm winter day, a hat, gloves, and a windproof jacket (fleece alone is not warm enough in the wind) are important, especially when it starts to get dark earlier in the evening. When the time changes, a headlamp would be nice but is not necessary--coaches will have lamps. Intro Devo - remember to continue to bring water to practice. Even when it's no longer hot outside, keeping hydrated is still critical. Also remember to eat a snack between school and skiing. Cold temperatures lead to higher energy requirements for training and keeping warm. You'll need both classic and skate ski setups. BSF provides skate ski package rentals for $50 for the season to all Introductory Development skiers. BSF does not rent classic skis presently, but we've been informed that Round House Sports now offers a leasing program for classic cross country skis. Combi gear sizing: ski length should be 1-3 inches longer than the child's height. Poles should reach from the ground to the top of the child's shoulder. Two Pairs: Some skiers choose to have both classic and skate skis and poles, and one pair of combi boots. For skate and classic specific gear, it is best to use the manufacturer's size charts which correlate the skier's weight and height to ski length and stiffness. At the ski swap, BSF volunteers/coaches will be on hand with a flex-test board to help match your skier with the best skis available. Please take advantage of this opportunity--skis that are too stiff or too soft can make for a very frustrating skiing experience. When purchasing new equipment through a local retailer, they will provide similar testing. For classic skis, skiers in the Intro groups can still use fish-scale (waxless) classic skis. (We do NOT recommend 3-pin bindings; they tend to get stuck in the groomed tracks.) Those in the Intro Devo groups will want to be looking towards a pair of waxable classic skis. If you have waxable classic skis: On classic days, please send your skier with a range of inexpensive kick waxes and a cork (local ski shops can recommend a few general kick waxes--blue, extra blue, purple, red--which can be kept in a baggie in your skier's bag), and their coach will help them put it on. Where can you find equipment? New Equipment may be purchased at Bangtail Ski Shop, Round House, or Homestake Lodge. Order early at Bangtail and receive discounted BSF prices. Both Bangtail and Round House also offer Nordic team nights each fall. Intra-Team Swap: each October, before the big Ski Swap, all BSF Nordic skiers get together and buy/sell used gear. It's an easy way to source good equipment with a coach on hand to answer questions. The Ski Swap held each November at the Fairgrounds. Thousands of items. (It's also one of BSF's biggest fundraisers.) BSF members get in an hour early. If you volunteer at the event, you get in even earlier! Bozeman kids are a hardy bunch, but we will cancel a session if temperatures are extreme--especially if paired with wind. Whenever possible, an email will be sent out notifying everyone as soon as it is determined to be too cold to train. Other chances: BSF is a traditional nonprofit, relying on donations and fundraisers to cover approximately 50% of the cost of providing programs. Volunteers donate thousands of hours each year. We couldn’t do it without you! We’re always looking for volunteers to help with our fundraisers, serve on committees, or help at Nordic, Alpine, and Freestyle/Freeskiing competitions. There’s a bigger picture to what BSF teaches skiers, when and why. BSF’s programs are consistent with the USSA Long-Term Athlete Development (LTAD) Systems. An emphasis on outdoor recreation. Parents should emphasize activity versus training. Child should play many sports, with active participation in coordination- or balance-based sports. Increase play to enhance specific elements of physical fitness in open environments. Continue to establish foundations of endurance through sustained activity and play. Add duration to activities and games. Introduce and practice mobility exercises through unorganized play and some structured activities. Use fun playful activities to enhance body awareness, spatial awareness and object manipulation. 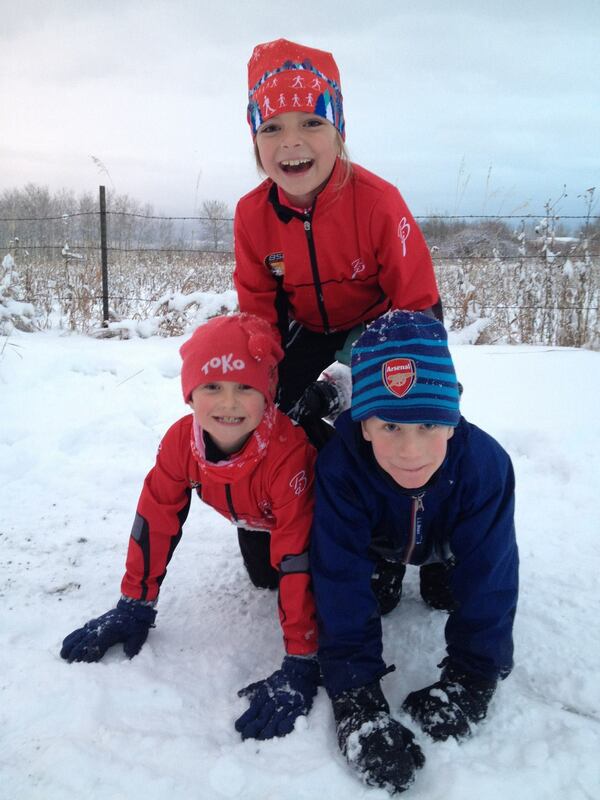 Athletes in Phase 2 should have fun on snow, with games and play enhancing both enjoyment and skills. 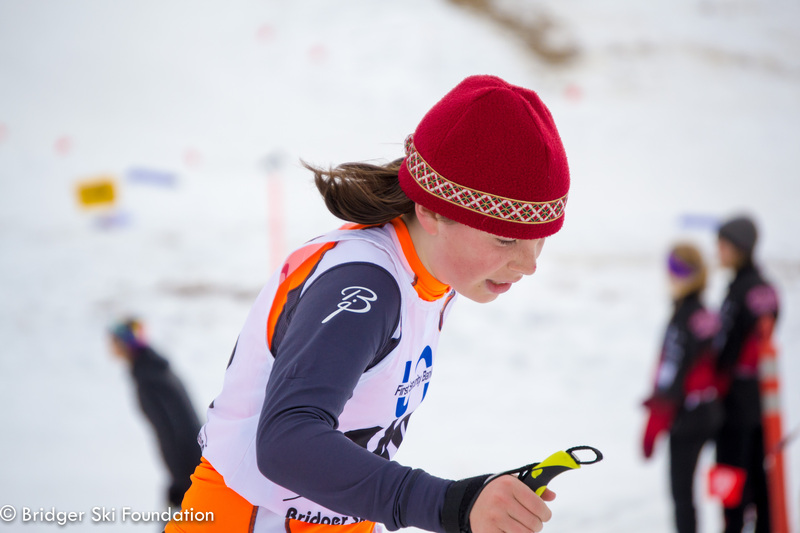 Gaining confidence and coordination while running on skis in multiple directions. Ability to balance on both skis while moving downhill. Tactics are learned through self-discovery by skiing and adapting to different terrain. Continued cultivation of a fun environment to allow child to continue to experience success. Use simple self-talk cue words to reinforce task-oriented behaviors. Focus on the love of sport. Compete for fun. Local competition at age-appropriate distances.